Many RV parks have laundry facilities, electric only RV camping sites, dump stations, recreation rooms, and play areas for children and adults. Pets are restricted in some parks, as well as vehicle type and even age in some of the nicest RV resorts. Rates vary from as little as $5 a night to over $50. You should expect to average between $20 and $30 per night in a private RV park or campground. Discount RV camping clubs can help cut nightly expenses, and vehicle specific RV clubs can be great for family and group RV travel. 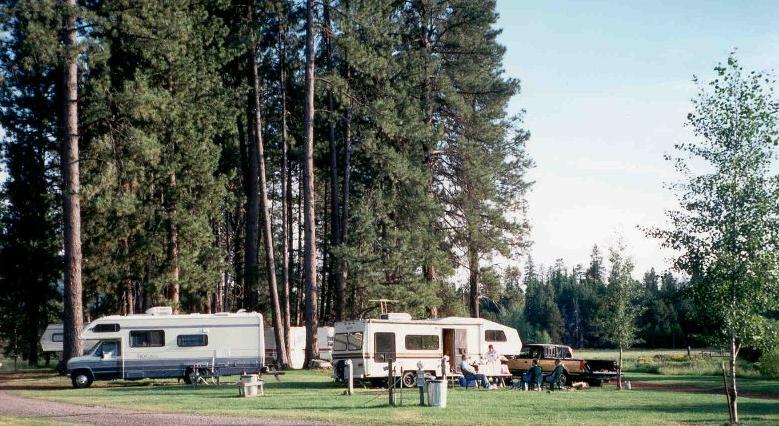 There is only one RV park and campground directories published to locate privately owned RV parks and campgrounds. The Good Sam Directory has thousands of private RV parks and campgrounds listed in every state. The listings include price, campsite size, and information about RV park/campground facilities. RV camping restrictions will be listed, maps and driving directions, and information about pets and any additional important information. The Good Sam RV Travel & Savings Guide is the only print edition of RV parks and campgrounds in North America. You can find most RV parks and campgrounds on the Internet if you have patience. Good Sam has their RV campground listings available online. If you search on the Internet for “RV parks” by city and state, you will get listings for many RV parks close to the town you wish. Be aware that many RV parks and campgrounds do not have Internet web pages. Another great option for a wide range of RV camping opportunities is MobileRVing.com. RV travel search engine where outdoor enthusiasts can find great places to visit around North America. Their website visitors can leave reviews, find local business deals and much more. Research tools for finding private RV parks are available on each state resource page accessible through the The USA RV Camping Map on our home page. These pages have state specific information about private RV parks, discount camping clubs, public campgrounds and more. RV parks can be affiliated with large nationwide organizations, and these organizations have well designed web sites that can help you locate their member RV parks. Some of these organizations offer discounted prices by becoming a member, while others offer location maps. Our Discount Camping section has information about groups of affiliated campgrounds that offer discounts in exchange for membership. There are some good deals to found, but you have to be careful to find the discount group right for you to get the maximum benefit of membership. The best-known RV park association is KOA, and with campgrounds in every state, you should have no trouble finding a convenient campground. Their website is easy to navigate, and you can make reservations online. Get a free KOA Directory/road atlas, free issue of camping life and 10% off daily registrations with the KOA Value Kard. Go Camping America is the non-profit National Association of RV Parks & Campgrounds (ARVC), the trade association representing the commercial RV park and campground industry throughout the United States. Their website is quite easy to navigate, and they have a clickable USA and Canada map to help you locate their member parks.